vacation rental will wow everyone! 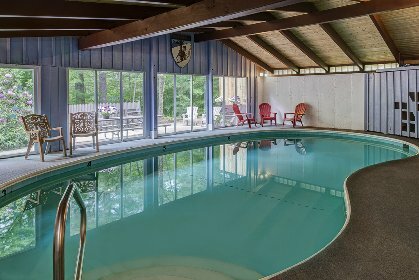 Heated INDOOR Pool and 10 Bedrooms! Like a Private Resort & Great Rates Too! has to offer - plan your next visit today! Free Wifi! 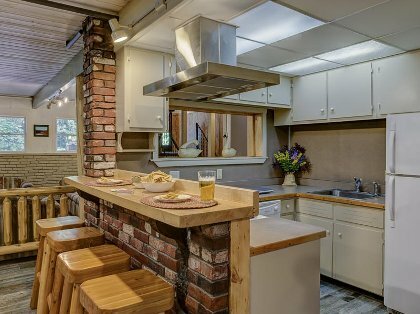 Private INDOOR swimming pool, propane fireplace, sauna, BBQ grill, dishwasher, telephone, microwave, toaster, coffeemaker, dishes/utensils provided, cable TV. No pets. Extras: Dance room;, patio with lounge chairs & picnic table. The Four Seasons Lodge made our special vacation even better. Our whole family was able to stay in one location and truly made this our "New Hampshire Home". Can't wait to go back! We stayed at the Four Seasons for a 4 night/3 day mid-week stay with our 5 boys. The kids really enjoyed the indoor pool and swam every morning and evening! The area is peaceful and beautiful; we enjoyed many of the close by hiking trails and waterfalls including Diana's Baths and Jackson Falls. We loved the fact that we didn't have to spend money on theme parks, boating, horseback riding etc. (which are all available in the area, of one desires) in order to have a great time. The house is clean and the pictures are an accurate representation of what the interior including pool, and exterior of the lodge looks like. Teena is very nice and responsive, we have already recommended the Four Seasons Lodge to our family and friends! Tenna the owner was very helpful from the first email contact until we arrived and answered all of our questions with honestly. We rented what we were expecting when we arrived, the description and locations are as described. The property is located a short distance from all areqas attractions and restuarants. The place was clean, well maintained and the location was perfect. The surrounding areas are very beautiful and the people were very friendly. We ate out at all the local establishments every night and the food and hospitality was excellent. Applebees and the Muddy Moose were great family spots and the food was excellent. We are from Canada and the drive was long but the place was relaxing and worth the drive. Overall we were pleased with the rental we were a little disappointed that there was no air conditioning but there are fans in every room.If we return to the area we will be looking up Teena again. Thanks again for everything! N- The location was amazing beautiful scenery on the road, the lodge was set back so you feel truly relaxed but yet so close to everything if you needed to go out! The pool was a huge hit we put the music on an the kids and adults were constantly swimming. There was so much space that we never felt crowded but at the same time it was very cozy. J-The pool & sauna and plenty of space. K- The area for one, close to everything. I loved the decorations on the walls & the downstairs was set up nice. M-The pool, the rooms, the lodge in general was very cozy but you didn't feel suffocated. A-The pool & sauna, location was good close to everything but secluded at the same time, the rooms were nice and the porches upstairs were a nice touch. Great way to wrap up February vacation and we will definitely be returning!! I spent Christmas weekend there with 19 of my relatives! We were very confortable, and it didnt feel crowed at all. We went away with 3 other couples and all of our 8 kids. (16 total) There were plenty of bedrooms and the beds were all queens. We were expecting to be able to ski every day but the weather didn't cooperate. It was a little disappointing but the area offers so many other things to do that we were never at a loss to keep the kids entertained. Having the indoor pool was a blessing. We had so much fun. The sauna, dance room and layout of the place made it very cozy for us. With the full kitchen, we were able to cook most of our meals and that saved us hundreds of dollars because restaurants get kind of expensive with that many people. I recommend prepping food and bringing it up with you. Lots of room in the big fridge. We'll be back. 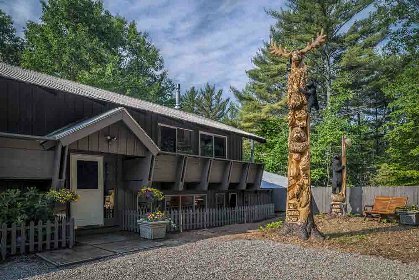 "... everyone had a most wonderful time at the Lodge. The kids especially enjoyed the pool." We planned a weekend skiing trip for 17 people. This house met every accommodation needed for such a large group. We were all comfortable and not at all squished. The location of the house is perfect! You feel secluded but are near everything all at the same time. The pool was a great added extra. I would recommend this house to anyone with a large group. 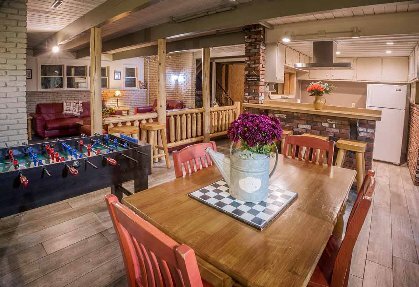 "We highly recommend staying at the Four Season's Lodge North Conway !!!" 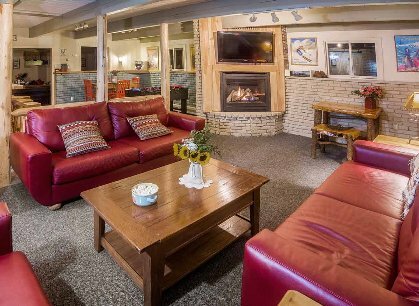 "My family and I stayed at the lodge three years ago and we really enjoyed our stay. 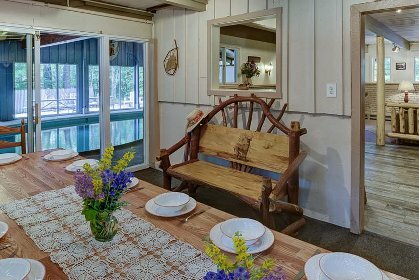 The lodge is in a quiet area yet it's just down the road from shopping, restaurants, mini-golf, Story Land, and so much more. It's also nice to have the pool so the kids can swim on rainy days. We weren't able to return the last two years but this summer we are fortunate enough to return twice. We had a great week with my wife's side of the family and another week booked for my side of the family. The owner of the lodge has always been very pleasant and accommodating. 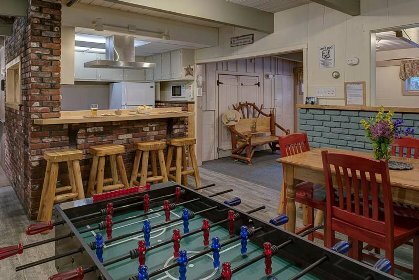 We highly recommend this vacation lodge to all people especially large families. We plan to return to the lodge yearly and if we are fortunate it will be twice a year." Can't wait to return for our fifth time! Awesome!! Really close to the slopes and outlet shopping!